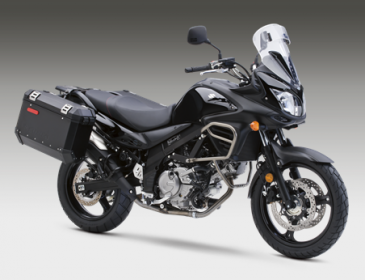 SEPARATE rumours have recently suggested that both Suzuki and Kawasaki are developing parallel twin 250cc adventure tourers to provide new entry-level additions to their dual-sport ranges. In Japan, the sometimes-accurate Young Machine reckons that the Strom 250 (described as a G-Strom 250 rather than a V-Strom, presumably due to the parallel rather than V-twin engine) is on the cards. Built up around the bargain-basement Inazuma 250, it seems a rational expansion of the range, providing an adventure-styled (if not truly off-road capable) machine at a price well below the V-Strom 650. And the same logic applies to rumours making the rounds in India that Kawasaki will build a Versys 250 around the engine and frame of the Z250/Ninja 250 (sold as a 300 over here). While there’s no solid evidence for either machine in terms of spy pictures, the idea of smaller-engined, cheaper bikes with the stance and look of ‘big’ adventure-style machines makes a fair bit of sense. Just as small sports bikes made sense back when superbikes were the aspirational be-all and end-all, presumably new riders who currently dream of big trailies would be the target for the speculative new models. And if Suzuki and Kawasaki do it, how long before there’s a CB300X (something Honda has already hinted at with its CX-01 concept bike) or a Yamaha R3-based XTZ320 Tenere?